Does paisley remind you of the 60's and the "Summer of Love?" 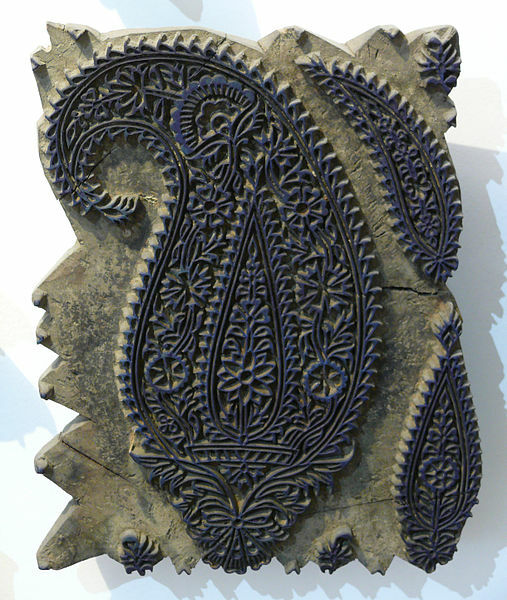 It certainly was when the paisley pattern was revived. Remember the Beatles had been to India and there was an interest in Indian spirituality? 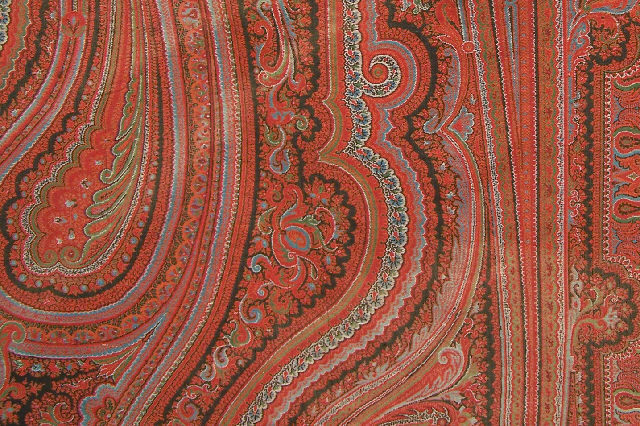 Actually, the paisley pattern was used in the manufacture of shawls in the Scottish town of Paisley way back in the 19th century. But wait. The Scots borrowed the pattern from the cashmere shawls which were made in Kashmir, India and imported in the early 1800's. Whatever, it's these 19th century shawls that I have been lusting after and collecting for the past two or three years. It's very hard to find one in perfect shape. Most are ripped, torn and just plain smell bad, as is the case with this one that I picked up for $40! I don't care. I just folded it a certain way and am letting it live out its days thrown over our leather chair. This one hangs on the back of the loveseat. It is all handmade. I love the turquoise color, as well as the intricate fringed border. I found this one at the Hillsborough Antique Show last week. It is a perfect square, with a black/brown center. I bought it to use as a table topper. I found this paisley on One King's Lane. I'll admit it, it was a splurge. It is 120 inches long and 60 inches wide. I bought it to use as a tablecloth. It is is mint condition! Not all paisleys are super expensive. This one is machine made, so it was more reasonable. Since it's not so delicate, it can actually be used as a throw. Traditionally, these were used as piano shawls. Kind of a Victorian thing. My piano shawl is a knock-off from Marshall's! It's fun to use the reproduction throws as tablecloths. This one was purchased several years ago on a trip to France. It has an apple green center! I used it for an Indian inspired tablescape that I did here. Paisley seems to be very popular right now. Even Pottery Barn got on the bandwagon with their wool paisley pillows, runners and tablecloths of recent seasons, all influenced by the Victorian and Kashmir shawls of the 19th century. Designers have been using them forever though, creating that layered, European look that I love so much. I'll never forget visiting a friend who had been transferred to London over 15 years ago. She always had amazing taste, so I was excited to see her apartment. The first thing I noticed was a huge red Victorian paisley on her table, skirted to the floor that she had recently purchased at a flea market. And of course, I'll never forget falling in love with this room. I saw it in a book featuring Bonnie Broten's home in Minnesota. 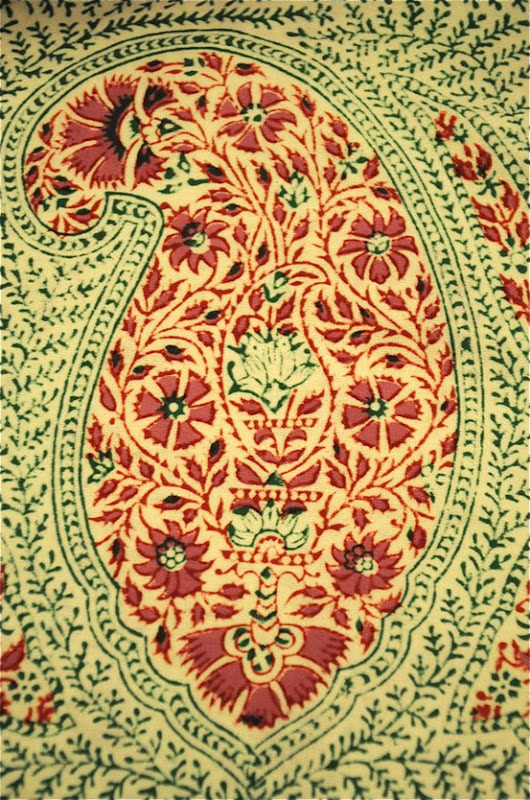 She was using paisleys in her decor way back when too! What is it about this amoeba like shape that appeals to me, I ask? What does it mean or represent? Some say it is a symbol of fertility. The Persians call it a boteh. Also called Persian Pickles and even Welsh Pears, it is a pattern that I'm continually drawn to! I absolutely love paisley, and you have some incredible examples! Gorgeous! Isn't there a photo application called Boteh? Maybe I'm wrong. These are so lovely and the muted colors are so usable in most rooms. I must be a PAISLEY-holic.. i have ALWAYS loved paisley and always will... It has such an elegant, organic look. LOVE LOVE LOVE your use of my favorite textile pattern...I never tire of your gorgeous blog posts..
Another instance of "separated at birth" Delores. I love paisleys and have collected them for decades. Some old, some new. A few years ago, I reupholstered a 19th century folding screen with beveled glass top with a beautiful Scalmandre paisley. It is in a corner of my bedroom and I just love it. I have long admired the shawl you used in your tablescape and have been lusting after the pillows Pottery Barn currently has. I may have to get them...not my fault. I have been drawn to Paisley for years, Plus, it mixed so nicely with plaid, and somehow adds more texture to a room. I am a texture lover. I just bought some paisley pillow covers for my living room. Your home is always so beautifully layered. 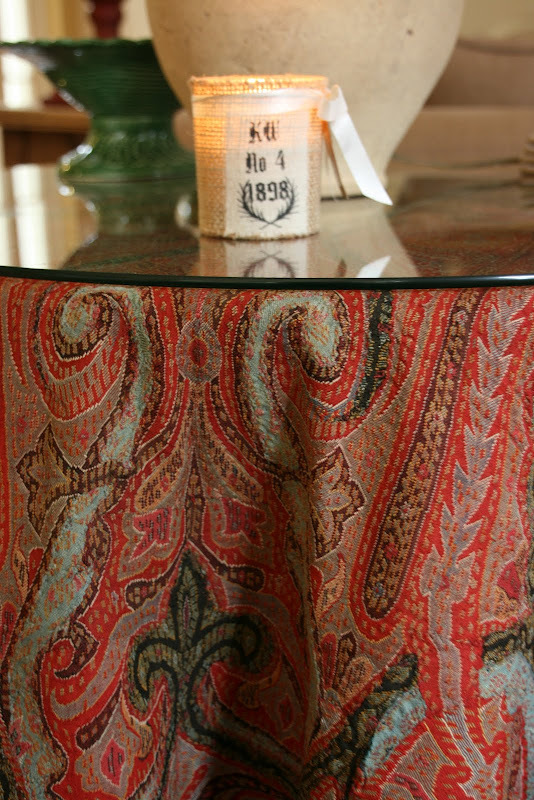 I love how the paisley's add to such a collected feeling around your stunning home! I love your Paisley shawls Delores, especially the square one on the table. I inherited my scottish grandmother's Paisley shawl (I think she got it from her mother), but it didn't really go in my current rustic cabin so I gave it to my sister. As my granny used to say, 'It's no loss what a friend gets'! Glad to have discovered someone else in love with paisley. You have collected some lovely samples, esp love the one with aqua touches. The design is fluid, soft, soothing. I have always loved paisley and recently purchased a remnant to cover a couple of pillows. I was thrilled when I opened my new Pottery Barn catalog and saw they were using a pattern very similar to the one I had bought. I had a purple paisley dress in high school (late 60's early 70'2) that was my favorite dress of all time. I don't know whatever happened to it (it certainly wouldn't fit me now) but I wish I had it. I'm sure I could find SOMETHING to do with it! Beautiful post. I so look forward to logging in every day, clicking on your blog and seeing what treasures you have for us all. This post was extremely interesting and strangely calming. I don't know it it was the colors or the pattern but I took my time a truly enjoyed the read. Paisley is so great as it's not too feminine for a masculine space. You have a great collection. I think paisley will always be in style in some form or other. Love your collection! 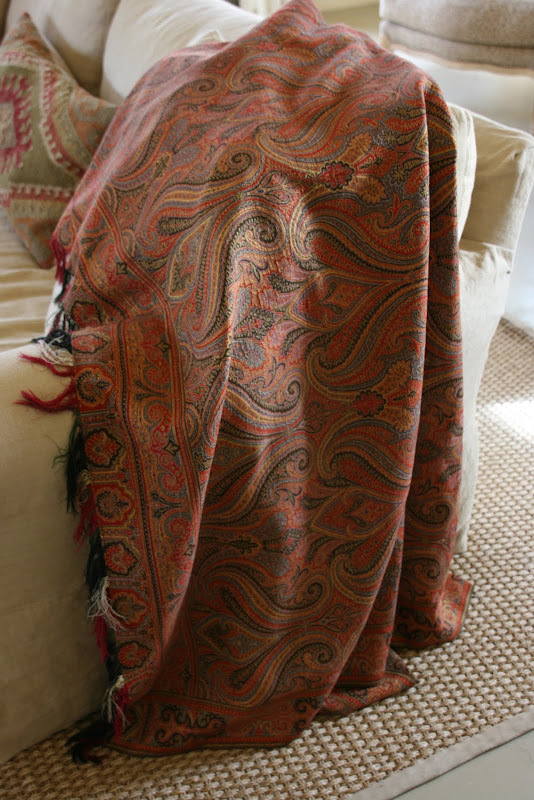 I have a small collection of paisley shawls (about twelve or so) that I have collected over the years. Most are in excellent condition (or have minor damage), and all are old except one. I don't plan to sell them ever. As you said, they can be pretty expensive. I guess I acquired mine during a period when they were not so much in style (or I was just in the right place at the right time), because I did not pay more than about $250 for any one of them. Great post! I'm very drawn to paisley too, and you have some beautiful fabrics. Love them! Hi Delores! Can you tell me where you got that leopard print frame? The one with your daughter in it. I have a friend who loves all things leopard and I'd love to get that for her! Thank you so much! Love all the paisley you're representing here! I love paisley too. It speaks to the Bohemian in me as I can use it to layer patterns because of it subtle patterning. It works well with a larger print. Love visiting your blog and am loving the Tuscan Style magazine you are featured in. Wonderful for you. I am so excited to see this post. 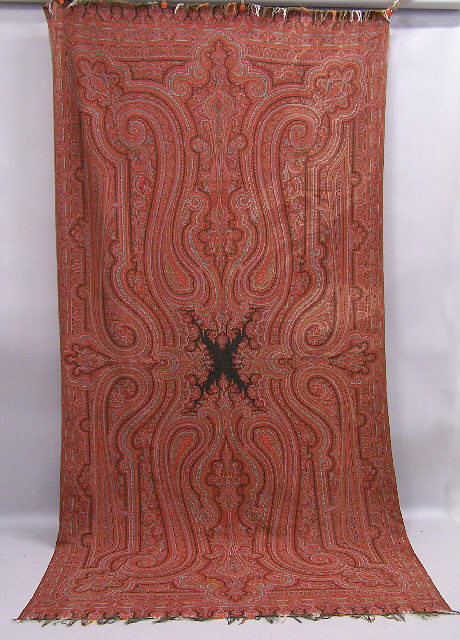 I just posted on an old paisley I just found recently and asked people to share their knowledge or any information they had on antique woven paisleys and several gals pointed me to you and this post! Would love it if you could tell me anything at all about my new find ---if you get a chance!? Your pieces are so lovely. Thanks so much for taking us through your collection, Delores.